Pirates Cove has everything you could want from a pirate game. You get to upgrade your pirate ship, fight sea battles, get treasure, and become famous. 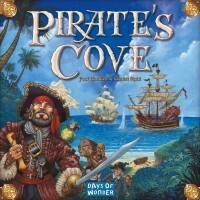 Pirate’s Cove is a fun game that family members, casual gamers, and even more avid gaming fans can all enjoy together. The rules are fairly simple and the game plays fast. Each turn, treasure cards are placed on the various islands. The players secretly choose which island to visit and everyone moves at the same time. If you show up alone, you get the treasure and can improve part of your ship(Hull, Cannon, Crew or Sails). If another player shows up at the same islands, you have to fight for the right to claim the treasure. Sea battles are fast and fun with players rolling six sided dice and trying to get 5’s and 6′ to damage their opponents ship. Depending on how you built you ship, you’ll have different advantages and disadvantages but nothing too complex. After you get enough treasure, you have to make pit stop at Treasure Island to bury the treasure and earn points. After all, no pirate ever became famous without burying treasure. In additonal to this, there is a legendary pirate wandering from island to island so if you wanted to see just how tough the Flying Dutchman or Blackbeard really is, you can find out for yourself or even team up with other players to take them on. The only downside to Pirate’s Cove is that some of the action cards you get in the game aren’t very useful and others aren’t well balanced. I would love to see this game get a revised version with some of these issues address. This is a small gripe, however, and doesn’t ruin the fun. Pirate’s Cove is still the best way to play pirate without actually picking up a cutlass and making someone walk the plank. A quick game (only 12 turns long) that pits you against your opponents to see who can become the most famous pirate in a year. The game starts with everyone on a basic boat with a few sails, crew, cannons and a small hull. How you proceed is up to you. Will you upgrade your sails so you are the fastest boat and first to fire in battle, upgrade your crew and cannons so you can roll more dice to shred your opponents boats, or upgrade your hull so you can haul more booty to treasure island where you can bury it for fame. A great game for 3-5 players. I have played it with 3 and 4 so far and the more players the better in my opinion. Each turn there is strategy to see which island you will go to. Will you go to one that alllows you to upgrade your cannons but that might have less treasure or will you go to an island that might allow you to upgrade a part of your boat you don’t need to but has much more booty for the claiming. The only problem, is if your opponents go to the same island, there will be a ship battle where one of you will limp away while the other claims the treasure. It is a great game. A must have for a group of pirate fans who love board games. To start, each player is given a pirate ship token, a mat to track ship upgrades and hold treasure, as well as nine gold and one tavern card. The object of the game is to have the most fame points of all pirates by game’s end. The game is played over 12 months (turns) with a turn starting with each pirate secretly navigating to one of six islands in the sea. These islands contain treasure cards for the pirates to plunder, and opportunities to either upgrade different parts of their ships, collect tavern cards or bury treasure and gold. Fame points are earned from the treasure cards that are plundered, by burying treasure chests on Treasure Island or through combat with other players, legendary pirates and the Royal Navy. Visiting one of the four islands where you can upgrade a component of your ship is vital to ensuring that you will be strong for the combat that occurs when two or more pirates end up on the same island. The four parts of your ship are sails, crew, cannons and hull. Sails determine the speed of the ship, which is the factor in determining who gets to fire cannons first in battle. Crew/Cannons represent how many dice can be rolled in battle which is determined by the lower of the two numbers (if you have 2 crew and 3 cannons, only 2 cannons can be fired). Hull determines how many treasure chests your ship can carry at one time. All upgrades require gold to be paid for them, which is also gained from plundering treasure cards from the island. Battles occur when two or more players end up navigating to the same island. They consist of players firing volleys from their cannons by rolling dice. The player targets one of the four components of his opponent’s ship, and a “hit” occurs when a 5 or 6 is rolled on any of the dice. A battle can consist of multiple volleys, but ultimately ends when a player opts to flee, or when one of the parts of their ship are crippled and they must retreat. The winning pirate gets 1 point of fame per defeated ship and the treasure card from island. The losing pirate must repair their ship at pirate’s cove and take tavern cards into their hand. These tavern cards can provide additional ship upgrades, allow players to send the Royal Navy after another pirate or provide fame points. After month 12, the fame points are counted, and again, the pirate who has gained the most fame is declared the winner. The fun of this game lies predominantly in the very immersive theme that Stahl and Randles seamlessly implemented into every aspect of play. The legendary pirates are taken right out of popular lore, while the tavern card flavor text and design could have been taken right from the set of the TV show “Black Sails”. As foolish as it sounds, it is difficult not to “speak pirate” as the game goes along, as this theme infiltrates all aspects of the game in the most enjoyable way possible. Theme can not stand without substance, and for the most part, the gameplay of Pirate’s Cove is fast, engaging and fun. All players navigate to the island of their choice at the same time, and plundering/upgrading resolves relatively quickly. Watching other players engage in combat is also an exciting enterprise, so young (and old) players will not suffer from stagnation of play. With the wide array of gameplay possibilities presented by tavern cards, you can be assured that every turn has the potential for something unexpected to occur. The game is certainly not without fault, however. Speaking of tavern cards, the range of their usefulness can fall anywhere between “not-at-all” and “near unbeatable”. Also, some of the rules of the cards make little sense, such as only one Mastercraft card (an additional upgrade) being able to be played at one time on a ship. This is unfortunate as these cards can allow players who have missed the opportunity to upgrade a chance to swing the game back into their favor. In fact, “catching up” may be the most frustrating aspect of Pirate’s Cove. This has been noted in other reviews, but in playing the game myself, I would agree that it is a significant issue. If a player loses battles early in the game and misses the chance to upgrade their ship, it can be very hard for them to battle back in the later rounds. They will be ill-equipped to engage in combat, which will minimize their chance to recoup well-needed fame points. The tavern cards gained when repairing your ship should help with this, but again, with a lack of balance in their power, it can sometimes be too late by the time something useful is drawn. Issues aside, I really enjoyed the experience of playing this game, and am looking forward to playing it again. While geared toward a younger audience, it does have enough strategic planning to be fun for a group of adults every now and then. The game actually lends itself well to the creation of house rules/variants to balance play a bit more, as the core mechanics are strong, but minor tweaks here and there could enhance the game even more. In its base state, however, Pirate’s Cove is an enjoyable, if not totally balanced, game experience that can be enjoyed by young and old scallywags alike. Give it a try. Yarrrh, there be treasure to be buried and pirates to sink in this game of fame and fortune in the golden age of piracy. Hoist your sail, fetch your parrot and get ready to do what it takes to be the most famous pirate of all in this seagoing adventure. 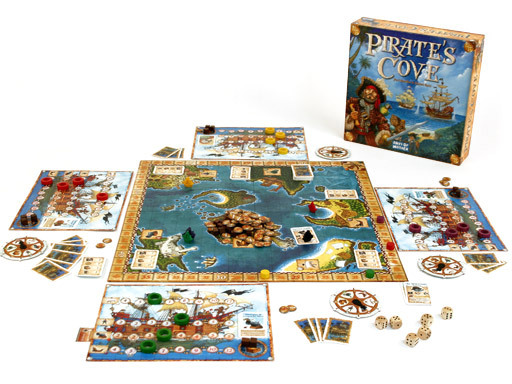 Pirate’s Cove has rapidly become a favourite amongst my regular gaming group, and for good reason – its simple mechanics, excellent use of theme and focus on player interaction make this an incredibly fun game to play. One of the standout elements of Pirate’s Cove is its simultaneous turns. At the start of each round, you’ll all get your navigation wheel and secretly turn its pointer to the island you want to visit then simultaneously reveal. But watch out, if another pirate visits the same island as you then you’ll have to battle it out – or flee like a cowardly dog (and possibly risk mutiny) – until only the saltiest pirate is left to seize the plunder for himself, while the losers flee to Pirate’s Cove to lick their wounds. Visit islands, battle other pirates (and the pesky royal navy), seize booty, upgrade your ship, visit the tavern, and mostly importantly – bury treasure for fame points to see who’s the saltiest dog of them all. Yarrh, Pirate’s Cove is a rollicking adventure of a game with beautiful artwork and quality components as you’d expect from Days of Wonder. I recently played this game with 3 other players, and got totally smoked. Background: Sail your ship from island to island to get sails, cannons, hull, sailors, etc. and essentially build up your ship’s strength. If you encounter another player (moves are “hidden” then revealed), you have to fight them for the island/cove. You can gather treasure too, etc. There are also “established pirates” like Black Beard floating around to complicate things. What happened: Every single move I had to fight someone. No free ride for me, ever. And during an early battle, I got kicked bad. Terrible dice rolls, smashed ship (which you get to “re-establish” but barebones), and then … yes, another battle to try to build up. Smashed again. I was everyone’s whipping boy, basically. So, while it’s kind of fun to have battles, roll dice, target the sales or hull, etc. for damage, if you fall behind, there is virtually no chance of recovering. The odds are against you … they are rolling too many dice, you have too little “cushion” (hull, crew, cannons) to win the fight. If you just want to have fun rolling dice, battling, etc. it’s fun. If you think you can overcome bad luck through clever strategy, think again. I bought this game after playing it at a game night with friends. I wanted a game that my wife would play. She doesn’t like deep strategy but likes games with a lot od interaction. Ticket To Ride is about her speed. This one fits the bill. There is some strategy involved as you decide where to strengthen your ship and try to figure out where your opponents will dock next. There is lots of interaction with other players as you battle on the high seas almost every turn. And there is the element of luck with rolling the dice to determine the outcome of battles. It is great fun for everyone! Simple pirate game. But in the few games I played, if things went bad early, you never recovered which got kind of frustrating. It is, however, a beautifully produced game. Add a Review for "Pirate’s Cove"